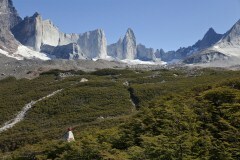 Hike one of the world’s great circuits to the mighty Paine Towers. Hike above the ice of Grey Glacier and enjoy dramatic views. View French Valley's enormous granite amphitheatre. 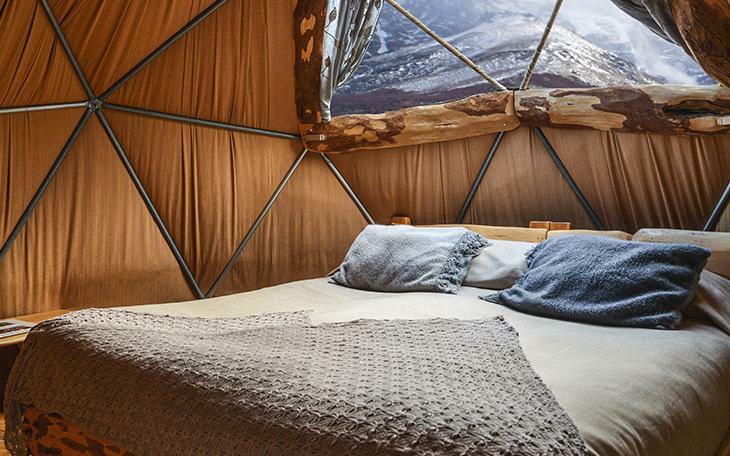 Choose between a cosy standard dome with shared bathroom or upgrade to a superior dome with private bathroom and heater. Trek with quality guides and have your entire luggage transported for you. 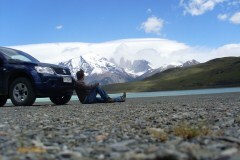 Day 5: Transfer to Punta Arenas, Puerto Natales or Calafate. If you are after something more strenuous then consider taking on the longer circuit trek which we also offer. Consult us for our range of options. 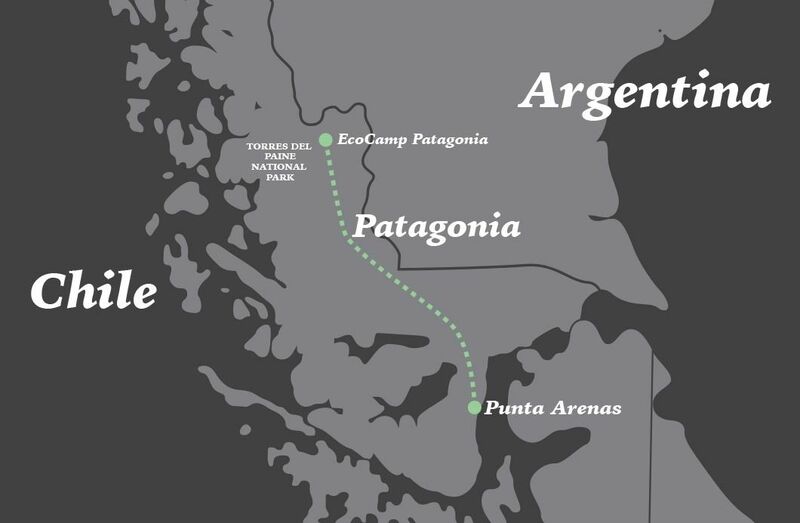 The trip begins when you’re picked up in Punta Arenas and driven to Eco Camp Patagonia. En route we make a couple of stops - First in Puerto Natales, a small, lively town on the shores of "Seno de Ultima Esperanza", where we’ll enjoy a hearty local lunch, and second at Cueva de Milodon, a massive prehistoric cave where the remains of a giant ground sloth were discovered in the 1890’s. The whole journey is very scenic, with plenty of wild birds and wonderful landscapes to be seen. Alternatively, you can start your trip in El Calafate across the Argentinean border. 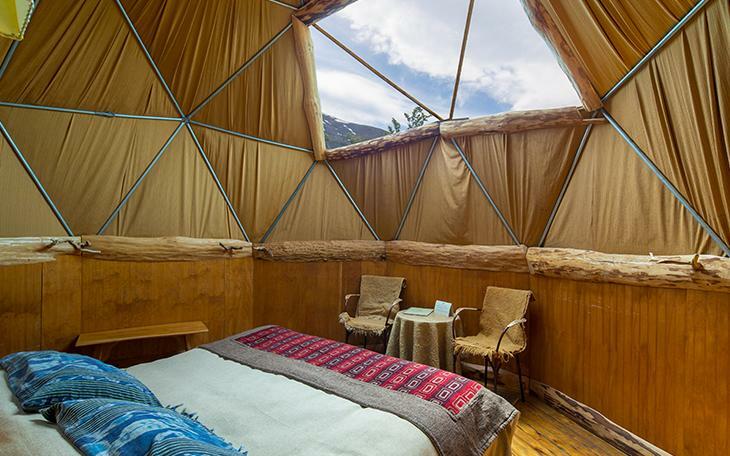 The day ends with our arrival and overnight stay at Eco Camp Patagonia, nestled in the heart of the park with a view of the Torres. During summer the sun sets around 11pm, so upon arrival there's plenty of light to admire the Patagonian steppe with its guanacos and snow-peaked mountain horizon. After breakfast, we start our day driving towards Pudeto dock and board the catamaran that takes us to the northern west sector of Pehoe Lake. It is here where we’ll start the challenging trek to Valle Frances (French Valley), along a steep trail that goes into the very heart of the Paine Massif. An undulating path leads us to the French River for our first glimpses of the hanging glacier. Then we will continue through a surreal landscape, crossing beech forests, to reach the French valley viewpoint where we enjoy magnificent views of both mountains and lakes. Enjoy lunch here with good possibilities of seeing avalanches from the hanging glacier, or simply observe the west side of the Cuernos (2600 M), Espada (2400 M) and Fortaleza (2800 M). Our way back will be the same until we reach the entrance of the valley. We will continue on a different path around the Southwest side of Paine Grande, the highest peak in the park, through native forests of Chilean fire bush and evergreen beech (Nothofagus Bethuloides), up to the shore of the Pehoé Lake. We’ll reach the Refugio Paine Grande, located on the peaceful shores of Lake Pehoe, where we’ll spend the evening and enjoy a replenishing dinner. *The excursion to French Valley can vary depending on the catamaran schedule. Today we hike from Paine Grande Refugio along the shores of Lake Pehoe to the northern end of glacial Lake Grey. We’ll enjoy a picnic lunch before boarding the boat that sails to the blue face of Glacier Grey. There's lots of time to marvel at this calving glacier during the boat ride across this lake, with its floating pieces of ice. From Lake Grey’s southern end we transfer to EcoCamp. After a big breakfast our goal today is to complete the most famous trek in Chile. 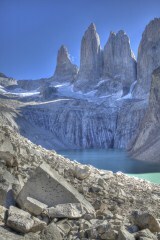 We’ll hike to the base of the Torres del Paine Towers, following the Ascencio River. Our walk will be uphill for one hour before stopping to observe the first glimpses of the valley surrounded by unbelievable beech forests, glaciers and waterfalls. Our big challenge comes as we climb the steep moraine, a mass of boulders leading us towards one of the world's most famous views overlooking the Torres. The famous Torres del Paine consist of three gigantic granite monoliths, the remains of a great cirque sheared away by the forces of glacial ice. After an uphill slog, the Torres eventually come into full view, rising majestically before us, with the glacial lake visible below. Is there any better place in the world to have lunch? After feasting on the view and our picnic, we’ll backtrack along the same trail through Ascencio Valley and return to EcoCamp. *During Shoulder season (October and April), the Towers Trek excursion might be cancelled because of weather conditions and safety considerations. We board an early morning vehicle, sit back, relax, and enjoy a scenic ride back to Punta Arenas in time to catch the evening flight. 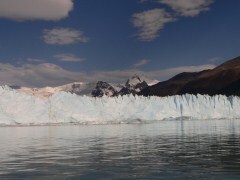 Alternatively, we can offer a departure to El Calafate over the border in Argentina. Breakfast & Boxed Lunch included. These are typical mountain huts, open to the public visiting Torres del Paine. 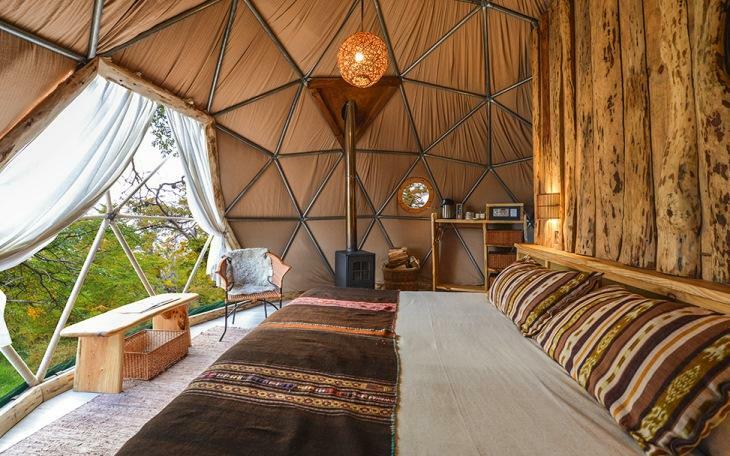 They have rooms for 4-6 people. The beds are single bunks and we will provide you with a sleeping bag and a polar fleece liner (you don't need to bring a sleeping bag!). The bathrooms are also shared and they have hot water. The refugios are heated and have a very comfortable dining area where plentiful meals are served. If refugios are unavailable, alternative accommodation will be provided in tents with prior notice.